There used to be an online bookgroup called “Who chose THIS book?”, the wail set up after a bookgroup has read a book that members didn’t like much. When I met Kay from my bookgroup in the supermarket, she didn’t have to ask the question because everyone knew that, yes, I had chosen this book. And no, they didn’t think much of it. I had heard good reviews of it and had read Toibin’s “The Master” about Henry James. I must confess to getting mixed up between Colm Toibin and Colum McCann (whose book This Side of Brightness I absolutely loved) so, yes, perhaps I was confused when I selected this book. Personally, I didn’t think that it was too bad. It is set in the dank, depressed 1950s in Dublin when young Eilis is encouraged by her older sister Rose to emigrate to Brooklyn where there are more employment opportunities. She goes and lives in a boarding house in Brooklyn, finds a job in a department store and gradually overcomes the homesickness that, even though she doesn’t recognize it for what it is, hollows her out. She meets Tony, an Italian plumber and becomes swept up into his large, impoverished and noisy family. When she receives sad news from home, she marries Tony before returning. He fears that she will not return, and so they marry as a guarantee that she will come back. Tony was right to fear. Once she returns to Ireland, it is as if she has never left. Even though she has been changed by the vitality and relative prosperity of America, bit by bit it all drops away from her as she slots back into the social life of the village. Employment seems to find her this time (with the help, perhaps, of her mother who wants her to stay), and she starts going out with Jim Farrell. No one knows that she is already married to Tony, back in Brooklyn. The book is told in a very Henry Jamesian fashion. There is no back story; small events are told simply and in detail; every little act is described by a narrator who seems to be hovering up in the corner of the room, watching everything. There is no interiority, only action, and they are the domestic, quotidian small actions of ordinary life. In spite of this- even perhaps because of this?- I found myself swayed, just as Eilis was, by the slow unfolding of a good-enough life. At first I was angry at her family and friends at home for wanting her to stay in Ireland: by the end of the book, I didn’t know whether she should leave or not. I felt sad no matter which way she moved. 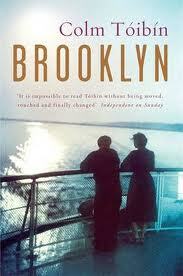 So, even though I enjoyed the book and was moved by it, certainly the rest of my bookgroup didn’t feel the same way. It was too long, they said; nothing happened, they said- and both these things are true. But “who chose THIS book?” Well, I did. Given another chance, I might not have chosen it for a bookgroup, but I’m glad that I read it for me. Don’t apologise. Brooklyn is, quite simply, elegaic. The young woman torn between two worlds and two very different futures reflects the story of many. What I found remarkable was Toibin’s evocation of her ‘semi consciousness’… she is swept up in things; Things happen… until as you say she is forced into a space where she can no longer deny or turn away from her being. Thankyou for this review.